Following the successful Toy Story of TERROR! special that aired last year during Halloween, ABC is giving fans another dose of the hit franchise with Toy Story That Time Forgot. 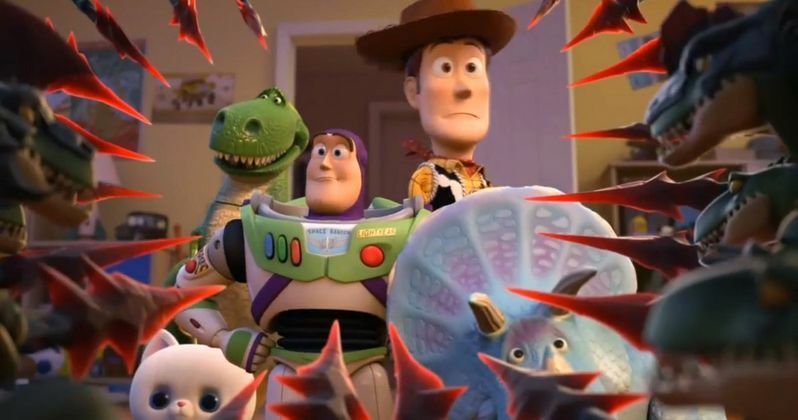 The first footage has been released through a promo for the U.K. broadband company Sky, which shows the Toy Story gang meeting the Battlesaurs. Take a look at this 51-second promo, featuring Woody (Tom Hanks), Buzz (Tim Allen), Rex (Wallace Shawn) and Trixie (Kristen Schaal) then read on for more information. The commercial was directed by Pixar veteran Mark Walsh (Toy Story: Partysaurus Rex), which gives us our first look at the Battlesaurs as they try to figure out what's wrong with their wi-fi. The short itself was directed by Steve Purcell, and will debut on ABC December 2. During a post-Christmas play date, the Toy Story gang find themselves in uncharted territory when the coolest set of action figures ever turn out to be dangerously delusional. It's all up to Trixie, the triceratops, if the gang hopes to return to Bonnie's room.